If you enjoy foods like cioppino or bouillabaisse, you will likely be content to eat a bowl of bourride (boo reed). This Mediterranean fish soup, a classic dish from the Provence region of France is thick like a stew and makes a wonderful one dish meal with crusty bread and an accompanying, garlic- mayonnaise thickening called aioli. 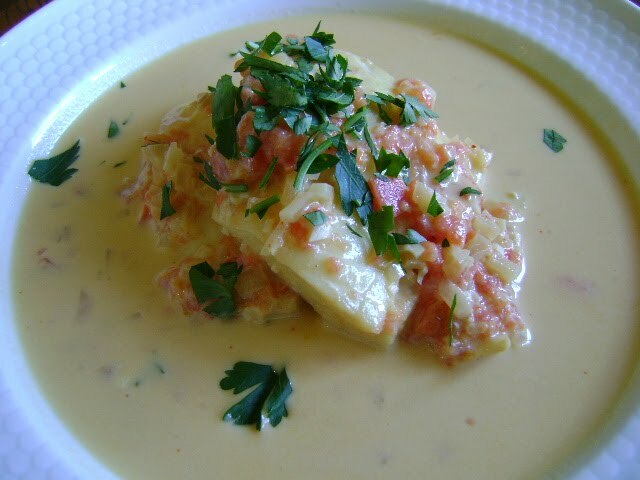 The fish soup bourride is simple to prepare and leisurely to make. The garlic, shallots et al sautéed in olive oil with tomatoes, herbs, orange rind, wine and fish stock impart a lovely aroma in your kitchen. The resulting liquid is the foundation of a fish poaching that leads to a fantastic bourride. You could serve this with boiled potatoes and French bread slices with aioli and make a grand robust meal. Crush and mash the garlic with a rolling pin or mortar and pestle or back of a sturdy spoon. Put the garlic in a bowl and stir in the yolks. If not used right away, cover and refrigerate. In a big pot, put the first 14 ingredients (water, vegetables, seasonings and oil) and bring to a boil. Wrap the fish filets in cheesecloth, raise the flame, and lower the filets into the liquid. Poach for 10 minutes at a simmer. Place a slice of bread into each of the 6 bowls. Put ½ of a filet atop each bread slice and cover to keep warm. Strain the stock in the pot. Whisk a 1/2 cup of soup into the egg yolks and then stir back into the pot. Put 1 tablespoon of the aioli sauce on top of each bowl. Try a bowl of bourride; it is a fine aromatic, poached, fish soup. Sounds delicious! I don't think I have many of the necessary ingredients in my kitchen though. JMAN: These products are generally available in the store and worth getting to make this. If you cannot get fresh oregano please use a teaspoon or so of dried. The popcorn/soda narrative was very funny. Thanks for calling. Oh wow!!! So glad you are doing A-Z Soups. My Hubs loves soups and I need a few more good recipes. I checked the ingredients in the recipe and I think this is a soup he would probably like. Thanks Anthony! Anthony, a REAL aioli!!!! My heart is singing with joy because you're suggesting we make a REAL AIOLI! YAY!!!! The soup sounds really great, and that's from a fish phobe. I think I'll be brave and try this one, if for no other reason than the real aioli. I'm impressed! wat a tempting soup..n u done this perfectly...can feel the taste..
FREETOP 1000: Thank you for the kind words. MY JOURNEY WITH CANDIDA: I'm so happy he would like this classic soup. ANDREA THE KITCHEN WITCH: This soup is great with the aioli, you will love it. MAHA: Thasnk you so much for your compliment, I appreciate it. NIKKI: This one is so aromatic, you'll be champing at the bit to eat some. The garlic mayonnaise sounds interesting and I was surprised to see the orange rind ingredient. GAIL M BAUGNIET: To me, 69F is perfect. Chilly is 50 to 40. Here in NE Georgia the weather and the foliage is lovely right now, been planting vegetables in the backyard. The garlic mayo goes great with the bourride. I have to admit I am not a fan of the watery tectured fish soup but if it's creamy like a bisque...I am IN!!! The picture is so appetizing! That soup looks outstanding. I love soups... Thanks! Looking forward to catching up here...I love all things French so I know I'd love this. I'm just back from Shanghai, Taipei, and Hong Kong-food adventures abound. I'm sure a few of my travel posts will be food related. Some things were delicious, others were 'questionable' : ) Good luck with the challenge! Yum! That soup looks delish and healthy! This looks absolutely delicious and for anyone with any kitchen chops at all, rather do-able. And, as mentioned before, a TRUE aioli! Stopping by on the A to Z Challenge from Debbie & Harry's Kitchen. Hi Anthony. Sounds like an interesting soup. JOANNE: I understand what you mean and am happy to say that this bourride is not watery. It is right up your alley. Regards. MATT CONLON: Welcome back Matt. If you like to cook look back for my beef and beer recipe. JOYCE: Wow, that must have been an exciting trip. I know what you mean about the food, they eat things we are totally unfamiliar with. DAMYANTI: You are 100% correct, fragrant, delish and healthy. Thanks. POONAM BORKAR: Thank You very much, I appreciate that. DEBBIE HENTHORN: It is a great soup and I don't think too difficult, The aioli is good with it as well. SUSANNE DRAZIC: Thanks Susanne, we love it.